The Clades – Who’s who! Article: Guest Post – What do we want from a Strong Female Character? It’s hard to decipher what the term ‘Strong’ Female Character actually means. Do readers want to read about a heroine who takes no prisoners, fights to the death and answers to no one? Or do we want to read about a character that tries her best, has flaws but deals with situations to the best of her ability? What does ‘Strong’ mean exactly? Strong as in strength? Strong as in compassion? Strong as in confidence? Many of our leading female protagonists in YA literature are strong characters, but flawed as much as they are strong. One of my favourite characters is Rose Hathaway from the Vampire Academy series. She’s sassy, mouthy, kicks a mean roundhouse and is devoted to her bonded best friend, Lissa. Critics might say that being bonded creates the first flaw in Rose’s character. The fact that she devotes her own life to ensure Lissa stays alive is maybe a flaw but shows a strength of character. She’s already accepted that Lissa’s life comes first in all things. At the end of Book 3, Shadow Kiss, though, Rose takes an unexpected path. She’s about to follow her love, Dimitri to kill him. This is where her strength reaches out revealing that not only is she flawed, she’s also human (or dhampir, whichever way you look at it.). She’s leaving Lissa behind for the first time ever. The most important points when I created Halíka Dacomé were not only to show her strong character but also show how human she was. She’s an Overlord, or General, of a mostly male army. She fights well, takes ownership of her decisions, and accepts advice from others and ultimately her strength in character is what drives her army to follow her. They believe in her, wholeheartedly. Underneath all of that she’s deeply flawed. Her love for her brother brings on an awkward situation when he won’t return to his post, preferring to stay with her in the final battle. Not even her strong will can remove him. He is her weakness but also her strength. When her childhood friend and love interest arrives, her emotions become twisted. She even sheds a few tears in his close company. He is also her weakness. Some might say that her love is her strength. This really all comes down to how the writer wants to define that particular aspect of the character. Love can always make a situation better or worse. The next most important aspect when writing a romance with a strong character is writing an equally strong opposite. Some readers were upset at the end of book 6, Last Sacrifice of the Vampire Academy series. Rose Hathaway chose Dimitri over Adrian. In truth, Adrian was never Rose’s equal. The relationship was born more of friendship and lust rather than equalling Dimitri in other ways. Dimitri and Rose know, really know each other. They work because they’re in sync. They know each other’s strengths and weakness as though they were their own. They balance one another in a way that Adrian and Rose never had. So, my next task when I write the sequel to The Battle for Arcanon Major is to show how she overcomes the realisation that her heart got in the way of her rational thinking. Will her strong character enable her to overcome her moment of weakness? 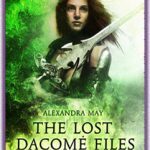 Alexandra May is an English author of four books, bringing together the epic saga of Halíka Dacomé and her modern day equivalent, Rose Frost. Copyright © 2018 Alexandra May. This website is the intellectual property of Alexandra May. No part of this website may be reproduced, stored in a retrieval system or transmitted in any form by any means electronic, mechanical, photocopying, recording or otherwise, without the prior written permission of the Copyright owner.